While some social workers quietly accept the DSM revisions published a year ago, others question whether this diagnostic tool conflicts with social work values and why social workers were not more involved in the revisions. At first glance, the Diagnostic and Statistical Manual of Mental Disorders (DSM) may seem harmless enough. After all, it’s just a book, albeit a thick and technical one. But when behavioral health providers throughout the country use it as a diagnostic and classification tool, the DSM exerts considerable power. The diagnoses and criteria within the manual can determine who is labeled as having a mental disorder and who receives access to services as well as whether insurance will pay for those services. The societal and economic implications of these decisions are significant, and that is why every new edition of the manual ignites a heated debate among mental health treatment providers. The DSM-5, published in May 2013 by the American Psychiatric Association (APA), was no different. Behavioral health professionals debated about what should be added to the manual or deleted, what diagnoses should be changed and, in some cases, whether the DSM should be used at all. Now that the manual has been published, social workers are learning about how the DSM-5 differs from its predecessor. But beyond the changes, the new manual presents an opportunity for social workers to reflect on what the development of the DSM-5 says about social work’s place within the mental health provider community and whether, by accepting the manual, they are acquiescing to a model of mental health that conflicts with social work’s strengths-based and ecological perspective. The DSM-5 is the product of a process that has lasted nearly 15 years. Work on the new edition began in 1999 and 2000 when the APA and the National Institute of Mental Health organized three planning conferences. Additional conferences were held between 2004 and 2008, and in 2007, members of the DSM-5 Task Force and workgroups began to be nominated and approved. The task force and workgroups included more than 160 researchers and clinicians in areas such as neuroscience, biology, epidemiology, and public health. The workgroups focused on the review and revision of DSM criteria, while the task force concentrated on broader issues such as how the new manual should be organized. The next major step forward in the DSM-5’s development was a series of three public comment periods on draft criteria, when more than 10,000 comments were submitted. In 2010 and 2011, field trials were held at academic medical centers and in community-based settings to test how the proposed criteria would be applied in real-world environments. Finally, the criteria underwent a series of reviews by APA panels, and the APA Board of Trustees approved the final criteria in December 2012. • ADHD: The criteria for ADHD in the DSM-5 are similar to those listed in the DSM-IV, but the symptom threshold has been lowered for diagnosing ADHD in adults. Adults must exhibit at least five symptoms listed in the domains of inattention and hyperactivity-impulsivity, while children must exhibit at least six symptoms. In addition, the onset of at least some symptoms must be before the age of 12 instead of before the age of 7. Examples have been added to the criteria to help clinicians better recognize ADHD behaviors in children, adolescents, and adults. • Autism spectrum disorder (ASD): Four previously separate disorders—autistic disorder, Asperger’s disorder, childhood disintegrative disorder, and pervasive developmental disorder, not otherwise specified—have been replaced by the umbrella term “autism spectrum disorder.” The change reflects the concept that people with ASD fall on different parts of a continuum based on symptom severity. • Bereavement exclusion: The bereavement exclusion for major depressive disorder has been removed. In the DSM-IV, clinicians were advised not to diagnose a person exhibiting depressive symptoms with major depression if he or she recently lost a loved one unless the symptoms lasted for more than two months. • Bipolar disorder in children: Children increasingly have been diagnosed with and treated for bipolar disorder, even though criteria included in the DSM-IV were focused on adults. In an attempt to prevent overdiagnosis and overtreatment of bipolar disorder in children, the DSM-5 includes a new diagnosis—disruptive mood dysregulation disorder—for children up to the age of 18 with chronic irritability and frequent and extreme temper outbursts. • Gender dysphoria: The diagnosis of gender identity disorder has been replaced with gender dysphoria, which lessens the focus on the "disorder" and therefore potentially lessens the stigma. The new diagnosis also focuses less on the incongruity between a person’s birth gender and the gender with which the person identifies and more on the distress that the person experiences because of this incongruity. • Hoarding disorder: This has been added as a diagnosis for those individuals who have chronic difficulty discarding or giving away possessions and who experience distress when faced with discarding these possessions. • Intellectual disability: The term “mental retardation” used in previous editions of the DSM has been replaced by intellectual disability disorder in alignment with the term commonly used by medical and educational professionals as well as advocacy groups and the general public. IQ scores no longer are used to determine severity of impairment; instead, severity is determined by adaptive functioning in the conceptual, social, and practical domains. • Multiaxial system: The multiaxial system of diagnosis has been scrapped in the DSM-5. Instead, clinicians can make notations about psychosocial and contextual factors affecting a client. • Organization of the DSM: Several disorders previously grouped together have been separated in the DSM-5. Obsessive-compulsive disorder, PTSD, and acute stress disorder no longer are part of the chapter on anxiety disorders. Gender dysphoria has been given its own chapter and has been separated from sexual dysfunctions and paraphilic disorders. The chapter on conditions first evident in childhood and adolescence has been eliminated; instead, diagnoses related to children and adolescents have been integrated throughout the manual. • Substance-related and addictive disorders: Unlike its predecessor, the DSM-5 does not separate diagnoses of substance abuse and substance dependence. Instead, criteria are listed for each substance use disorder (e.g., alcohol use disorder, opioid use disorder) along with criteria for intoxication, withdrawal, substance-induced disorders, and unspecified substance-induced disorders. In addition, gambling disorder has been added as a behavioral addiction. More information about these changes and the multitude of other changes can be found on the APA’s DSM-5 website (www.dsm5.org). 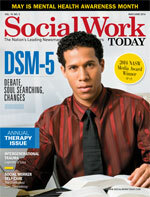 Resources specific to social work are available on the NASW website (www.socialworkers.org). A More ‘Social Worker Friendly’ Manual? Although the DSM-5 differs in numerous ways from its predecessor, it still reflects a disease-based, pathology-driven worldview often at odds with the social work perspective. But is the new manual even a tad bit more “social work friendly”? Perspectives on this question are as diverse as the social work profession itself. Take, for instance, Monique Prince, MSW, a social worker practicing in Maine, and Jack Carney, DSW, a social worker in New York. Listening to their thoughts about the DSM-5 makes someone wonder whether they are speaking about the same publication. Prince is effusive in her praise of the DSM-5, saying that the publication has made great strides in recognizing how cultural factors such as religion and ethnicity can affect the presentation and diagnosis of mental disorders. She also says the APA’s decision to bring in perspectives from a variety of fields, such as biology and neuroscience, while it was developing the manual demonstrates the organization’s desire to make the publication more person-centered. On the other hand, Carney has been an outspoken critic of the DSM and is a leader in an effort to urge social workers and other mental health professionals to boycott the latest edition. The committee of mental health professionals organizing the boycott argues that the manual is scientifically unsound, will result in mislabeling people as mentally ill, and will cause unnecessary treatment with medication. Disagreements also can be found between social workers discussing single changes in the DSM-5. Thieleman coauthored a commentary in Social Work (Thieleman & Cacciatore, 2013) that argued the APA’s decision to eliminate the bereavement exclusion for major depressive disorder will lead some mental health providers to prematurely diagnose grieving people with major depression—a diagnosis that likely will be followed by treatment with psychotropic medications. But Mirean Coleman, MSW, LICSW, CT, senior practice associate at NASW, views the elimination more positively. By eliminating the exclusion, the APA is showing its recognition that grief over a loss cannot be pigeonholed into a specific time period, she says. Like the decision to eliminate the bereavement exclusion, the APA’s decision to replace gender identity disorder with gender dysphoria cannot easily be labeled as solely good or bad. Arlene Istar Lev, LCSW-R, CASAC, of Choices Counseling and Consulting in Albany, NY, has long advocated for the removal of DSM diagnoses based on the construct of gender. Although that did not happen in the DSM-5, Lev believes the replacement of gender identity disorder with gender dysphoria is a step in the right direction. "In the DSM-5, the language has been reframed so that it is not a person's gender that is being diagnosed but rather their dysphoria," says Lev, who also is a lecturer at the School of Social Welfare at the State University of New York at Albany. "Diagnoses are, by definition, about human pain and suffering, so despite my reservations about having a gender diagnosis in the DSM, focusing on dysphoria rather than identity is a definite improvement." Despite debate among some social workers about the DSM-5, the practical reality is that many social workers must use the manual for reimbursement and assessment in the clinical field. Like it or not, the DSM is here to stay, says Lisa Zoll, LCSW, an adjunct instructor who teaches a DSM course in the MSW program at Temple University’s campus in Harrisburg, PA.
Is Social Work’s Voice Too Weak? In some cases, external forces have stifled social work’s voice. According to Washburn (2013), only one of the more than 100 members of the DSM-5 Task Force and workgroups had any formal social work education. Coleman says NASW requested participation on the task force and workgroups but was unsuccessful. In addition, social work’s opinions may not be taken as seriously because of the primacy of the medical model in society, according to Joseph Walsh, PhD, LCSW, a professor at Virginia Commonwealth University’s School of Social Work. People increasingly are seeing medication as the best way to get quick relief from mental distress, he says. Observers cite myriad reasons why many social workers have not gotten involved in the debate over the DSM. Some social workers may feel forced to use the manual and have no alternative, and others may believe that they cannot change the system, while still others may be indifferent. There probably are many others who don’t have issues with the DSM-5 and don’t have a problem using it. No matter the reasons, it’s not too late for social workers who want to get involved in the DSM debate to express their opinions. Thieleman suggests writing letters to the APA and other groups involved in the manual’s development as well as encouraging more debate within the social work profession. Social work educators need to make sure that students not only know about the DSM’s intricacies but also can examine the manual with a critical eye and understand why social workers often feel conflicted about it, Walsh says. Social workers can take heart that they may not have to wait another decade or two to shape future versions of the DSM. The APA is moving toward a system of revision in which updates will be made incrementally as new breakthroughs in the understanding of mental illness are made. This new system of revisions could mean more opportunities for advocacy, Ackerson says. Thieleman, K., & Cacciatore, J. (2013). The DSM-5 and the bereavement exclusion: A call for critical evaluation. Social Work, 58(3), 277-280. Washburn, M. (2013). Five things social workers should know about the DSM-5. Social Work, 58(4), 373-376. Among the primary criticisms of the DSM-5 development process are that it lacked transparency and did not pay enough attention to how the environment affects manifestation and diagnosis of mental disorders. In an attempt to bring more clarity and context to the process, a group of academics and researchers has proposed the creation of an independent, multidisciplinary research review body to monitor how societal forces shape diagnostic patterns—information that then could be used to enhance future DSM revisions. In their article in Health Affairs, Hansen and colleagues (2013) argued that the review body would improve the DSM’s accuracy by highlighting social, institutional, economic, contextual, and policy factors that influence mental health diagnosis and treatment. For example, high awareness of a mental disorder in a community can lead to more people within the community being diagnosed with that disorder. Insurance reimbursements can encourage mental health professionals to make diagnoses that are the most lucrative, while pharmaceutical marketing can convince consumers that their behavior is a sign of some sort of disorder. Hansen, H. B., Donaldson, Z., Link, B. G., Bearman, P. S., Hopper, K., Bates, L. M. (2013). Independent review of social and population variation in mental health could improve diagnosis in DSM revisions. Health Affairs, 32(5), 984-993.